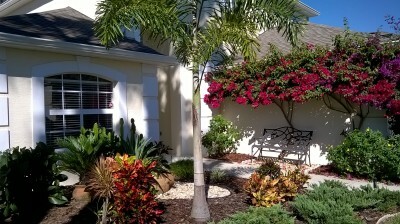 3 bedroom, 2.5 bathroom villa in the Highlands Reserve Golf & Country Club community. Owned by Debra Lacey. Ref: 1392. 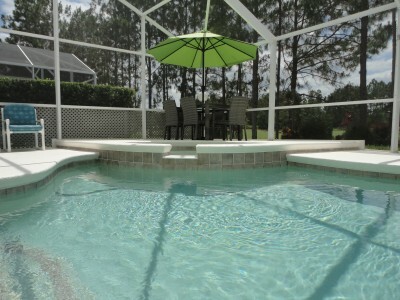 PINE VIEW VILLA is a beautiful 2 storey, 3 bedroom, 2.5 bathroom home, sleeps 6. Featuring a Games Room & TVs in all bedrooms and *FREE* Local, International calls + Wireless Internet connection. Digital Film/Sports channels.The SW facing Pool/Spa overlooks the 10th fairway of *HIGHLANDS RESERVE GOLF CLUB* - Disney is within 15 mins drive. For privacy reasons, the marker on the map shows the Highlands Reserve Golf & Country Club community location and not actual villa location. 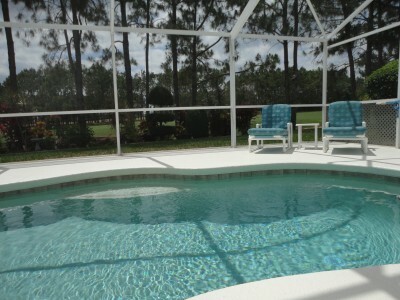 PINE VIEW VILLA is a beautiful 2 storey, 3 bedroom, 2.5 bathroom home,sleeps 6. Featuring a Games Room & TVs in all bedrooms and *FREE* Local, International calls + Wireless Internet connection. The SW facing Pool/Spa overlooks the 10th fairway of Highlands Reserve Golf Club. Disney is within 15 mins drive. "PINE VIEW VILLA" is located on the prestigious HIGHLANDS RESERVE GOLF CLUB on Highway 27.This is not your typical Florida golf course! Highlands Reserve sits atop one of the highest areas of Florida and offers remarkable scenery along with a course designed for hot golf. "This championship Mike Dasher design gives you pine tree-lined fairways reminiscent of the Carolinas, open spacious fairways likened to the great Scottish courses, and a bit of old Florida with citrus trees along the countryside. Large, fast, undulating greens make this course challenging and fun for all levels of golfers. 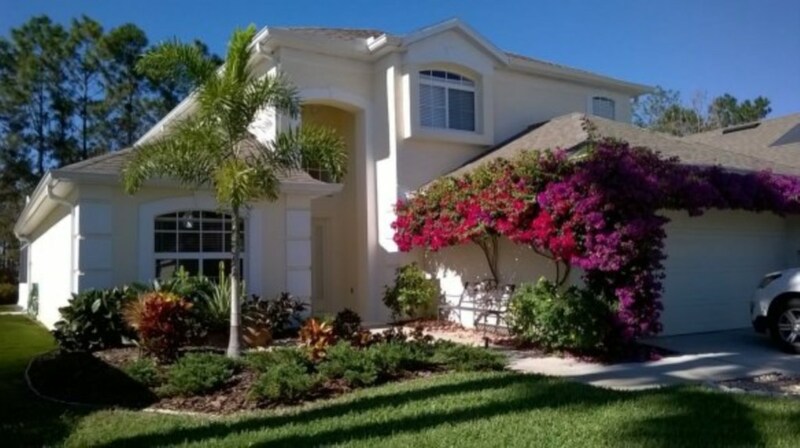 Conveniently located just minutes from Disney and all major attractions, Highlands Reserve Golf Club is a Central Florida favorite!" The villa is located close to the local Publix supermarket, pharmacy, bank, petrol station, restaurants and takeaways. A TRULY BEAUTIFUL VILLA, IN A WONDERFUL LOCATION, JUST WAITING FOR YOU! PINE VIEW VILLA is a beautiful 2 storey, 3 bedroom, 2.5 bathroom home with Games Room and SW facing Pool/Spa. 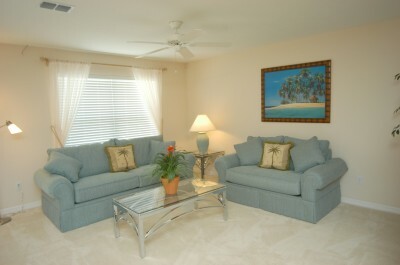 Fully air-conditioned and ceiling fans throughout. TVs in all bedrooms. 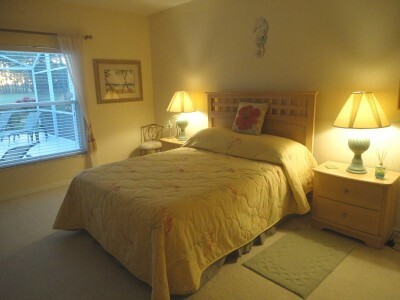 Sleeps 6 in three Queen bedrooms. The SW facing Pool/Spa overlooks the 10th fairway of Highlands Reserve Golf Club. The spacious and airy Great Room features vaulted ceilings, cathedral windows and a centrepiece fireplace. It is furnished to a high standard and an entertainment centre has a large Flat Screen TV (with Digital Film & Sport channels) IPod dock & DVD Player. The fully fitted Kitchen is equipped with a double door fridge with icemaker, oven, microwave and dishwasher. 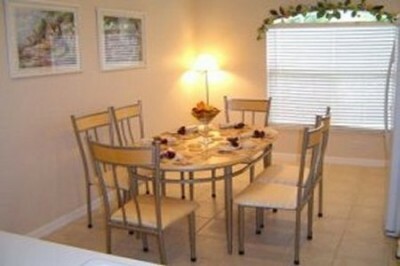 It features a breakfast bar and stools and a dining area that seats 6. Adjoining the kitchen is an Informal seating area with sofa, which leads through the patio doors to the covered Lanai and pool. The S/W facing pool deck is upgraded and extended & privately screened.It overlooks the 10th fairway of Highlands Reserve Golf Club.The 28 x 14 ft pool has underwater lighting and jets. A relaxing spa adjoins the pool and heating is available for both. 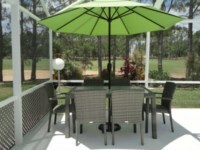 Pool furniture, including a table & chairs for 6 + parasol/sun loungers, is supplied. 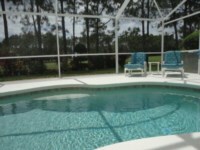 Pool towels are provided.The pretty garden is lit at night and leads onto the golf course. 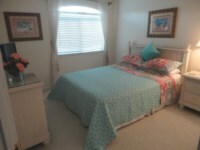 Walking distance to the Club House & Community Swimming Pool/Tennis Courts/Kiddies Play Area. The Master Bedroom, which overlooks the pool area is furnished with a Queen size bed, dresser, cable TV and large walk-in closet which has a floor safe. The en-suite Master Bathroom features a large tiled walk-in shower, bath tub, double vanity units and separate wc. The stairs lead to the first floor, where the open plan galleried Lounge, with entertainment centre with Large Flat screen Digital Cable TV/DVD Player/CD music system are located. A good selection of dvds/cds and books are supplied. Two further Queen size bedrooms, and the second bathroom are on this floor. 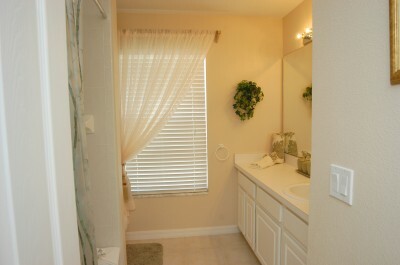 Both bathrooms are supplied with hairdryers. 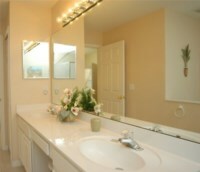 On the ground floor, there is a half bathroom,consisting of wc and handbasin. The Laundry Room is fitted with washing machine/tumble dryer/iron & ironing board. 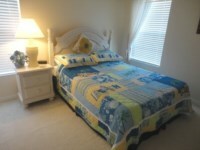 All Bed linen and Bathroom and Pool towels are supplied. The Games Room has a pool table, table football, and darts board. 2 bicycles are provided for your use around Highlands Reserve. Also included are tennis rackets for use at the tennis courts which are within easy walking distance. 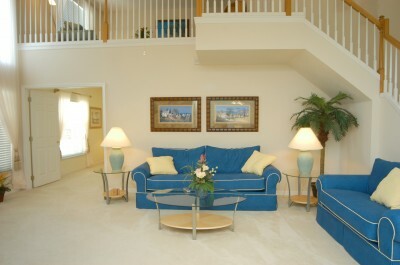 "PINE VIEW VILLA" is furnished to a high standard throughout. A beautiful home with many extras to make your stay as comfortable as possible. 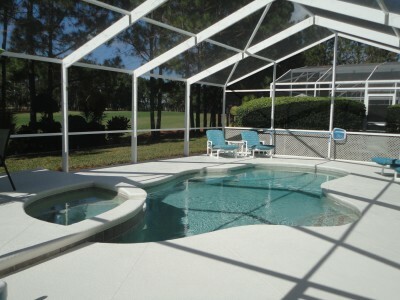 Low season prices from $945.00 / £585.00 per week. 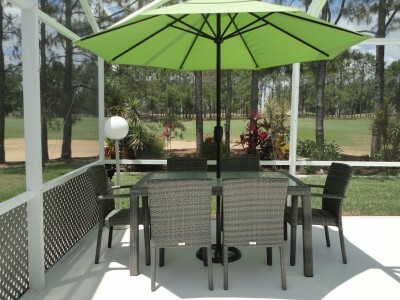 Peak season prices from $1120.00 / £695.00 per week. The above rental rates are per villa, per week, prices are inclusive of Local Taxes/Phone calls/Internet Connection/Utilities and Cleaning. Optional Pool and Spa heating is £100/$175 per week. Minimum Stay: 1 week - 2 weeks Easter & Xmas and other School Hols. Bookings of 6 nights or less incur a cleaning surcharge of £50/$90. A Non-Refundable deposit is required with booking form of £150/$250 per week, balance is due 8 weeks prior to departure. A Security deposit of £200/$350 is required, payable with final balance and returned 2 weeks after departure from the villa. 29 May 2019 to 11 Jun 2019 - use the form below to enquire about these dates. 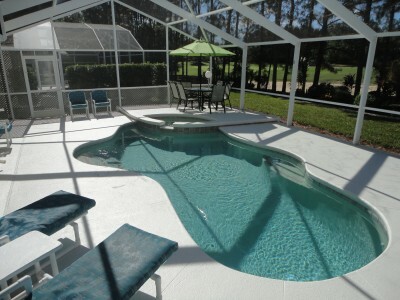 As former vacation (rental) villa owners we are very choosy about the villas we stay in and know exactly we we want! We certainly found it all in Pine View Villa. 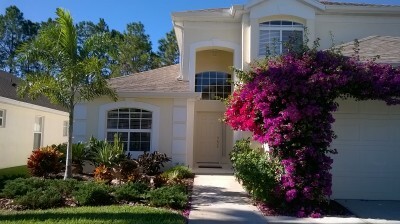 Pine View is ideally located on highway 27 with easy driving to Walt Disney World and Interstate 4. The villa is very comfortable and fully equipped with everything that makes the home ideal for the perfect family holiday. 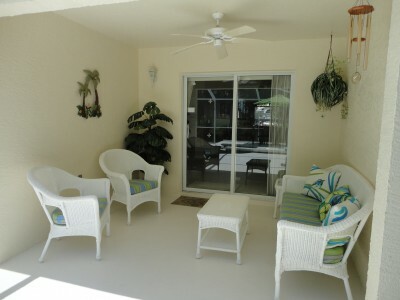 The pool area is spacious with ample pool furniture; dining outside is a delight. 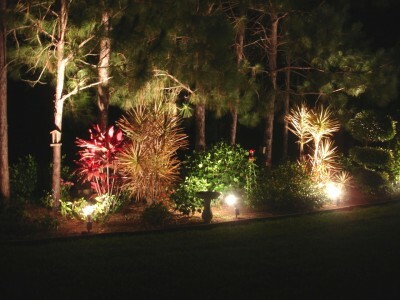 Pine View Villa has a superb and tranquil view of the golf course. Re-charge your batteries in this much loved and well looked after home. The owners are clearly very focussed on guest care and customer service. Debra was great to deal with before and after our trip. Your enquiry will be sent to villa ref 1392 only. This page has been viewed 37590 times since 12 Aug 2004.